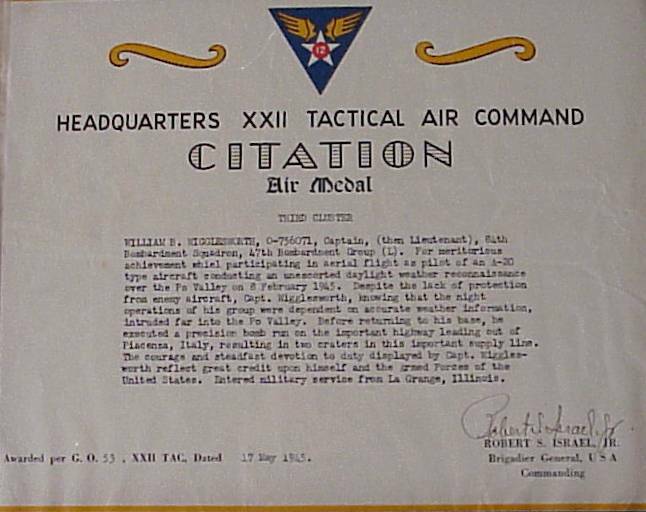 The Air Medal was established by Executive Order 9158, 11 May 1942 as amended by Executive Order 9242-A, 11 September 1942. 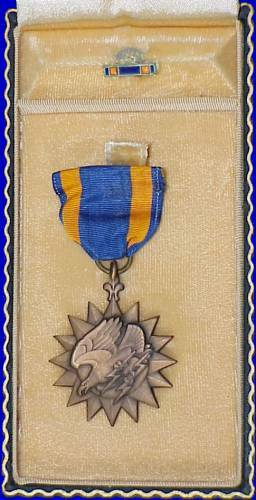 The Air Medal is awarded to any person who, while serving in any capacity in or with the U.S. Army, will have distinguished himself or herself by meritorious achievement while participating in aerial flight. Awards may be made to recognize single acts of merit or heroism, or for meritorious service as described below. 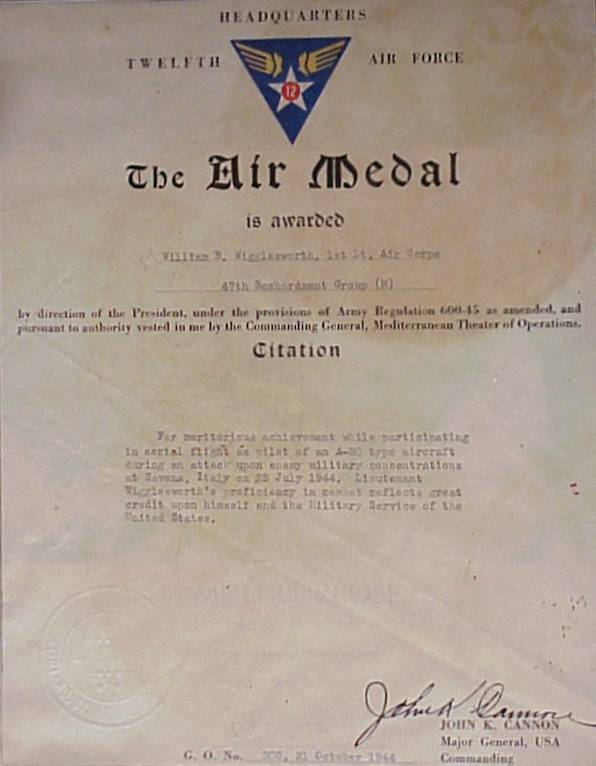 Awards may be made for acts of heroism in connection with military operations against an armed enemy or while engaged in military operations involving conflict with an opposing armed force in which the United States is not a belligerent party, which are of a lesser degree than required for award of the Distinguished Flying Cross. 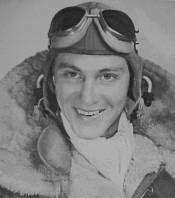 Awards may be made for single acts of meritorious achievement, involving superior airmanship, which are of a lesser degree than required for award of the Distinguished Flying Cross, but nevertheless were accomplished with distinction beyond that normally expected. Awards for meritorious service may be made for sustained distinction in the performance of duties involving regular and frequent participation in aerial flight for a period of at least 6 months. In this regard, accumulation of a specified number of hours and missions will not serve as the basis for award of the Air Medal. 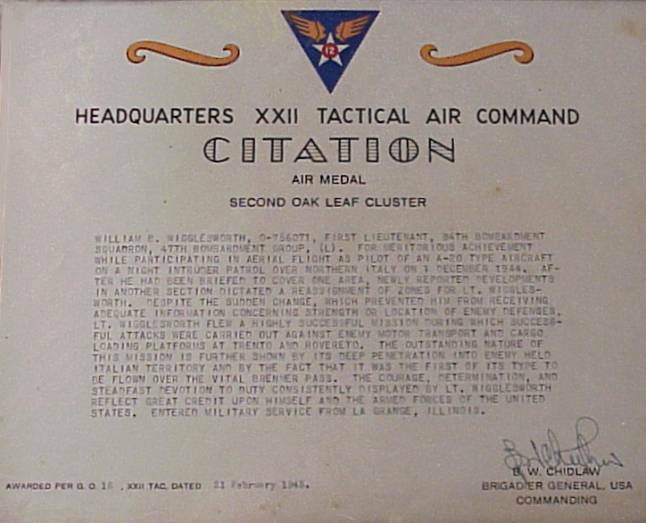 Criteria in paragraph c above, concerning conditions of conflict, are applicable to award of the Air Medal for meritorious service. Award of the Air Medal is primarily intended to recognize those personnel who are on current crewmember or noncrewmember flying status which requires them to participate in aerial flight on a regular and frequent basis in the performance of their primary duties. However, it may also be awarded to certain other individuals whose combat duties require regular and frequent flying in other than a passenger status, or individuals who perform a particularly noteworthy act while performing the function of a crewmember, but who are not on flying status as prescribed in AR 600-l06. These individuals must make a discernible contribution to the operational land combat mission or to the mission of the aircraft in flight. Examples of personnel whose combat duties require them to fly include those in the attack elements of units involved in air/land assaults against an armed enemy and those directly involved in airborne command and control of combat operations. Involvement in such activities, normally at the brigade/group level and below, serves only to establish eligibility for award of the Air Medal; the degree of heroism, meritorious achievement or exemplary service determines who should receive the award. Awards will not be made to individuals who use air transportation solely for the purpose of moving from point to point in a combat zone.